The "factory of the future" is here. We have the technology and professional knowledge, say leading manufacturing consultants Roy Harmon and Leroy Peterson, to implement revolutionary concepts that many managers might regard as futuristic. In this path-breaking book, Harmon and Peterson move beyond theory to document more than a hundred real-life applications of productivity improvement -- from the focused factory and assembly process design to the plantwide plan -- gathered from Andersen Consulting, Arthur Andersen &amp; Co.'s offices around the world. 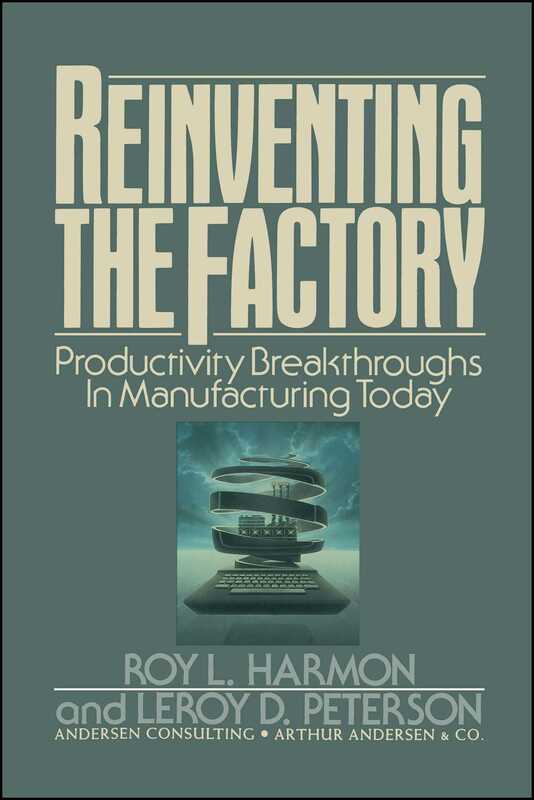 The reorganization of existing plants into multiple "factories within a factory" is the single most important feature of productivity improvement, according to Harmon and Peterson. These smaller units known as subplants, are honed to the smallest practical size to ensure the highest level of productivity. Multiple subplants can be clustered to focus accountability and authority for production of product families into easily managed groups of processes. With hundreds of diagrams and using examples of companies that operate focused factories in dozens of countries, Harmon and Peterson detail both the physical and organizational changes required to make the focused factory a successful and profitable feature of a plant's modernization. In addition to creating subplants and subplant clusters, Harmon and Peterson show how manufacturers can dramatically increase productivity by adopting a plantwide plan. In its most basic form, the plantwide plan is a layout of a single factory. It includes, to the extent practical, not only the ideal layout but also step-by-step strategies for movement of individual processes from their current locations in the factory to final target destinations. Harmon and Peterson explain how managers can use the plantwide plan to eliminate the common problem of compromising ideals too early to accommodate assumed constraints and turn an existing factory into a competitive factory of the future -- today. Flexibility, creativity, and dynamic planning are key concepts for attaining superior manufacturing results. For plant modernization to be profitable, the organizational structure must keep pace. Achieving world class status is not enough. The new hallmark of excellence must be continuous improvement to maintain a superior position. The plans and suggestions outlined in Reinventing The Factory allow the entrepreneur the responsibility and authority to effect ongoing improvements and render processes adaptable to reflect additions or removals of product lines, changes in sales volume over time and modifications resulting from previous or concurrent improvements. Harmon and Peterson provide the valuable tools and methods necessary to attain such goals. They highlight the dynamic nature of progress itself and show how managers can overcome the most tenacious habit: the resistance to change. 1. When management set unbelievably high targets, it expected improvements of 50 to 90 percent and more. Surprisingly, these high targets were almost always matched and surpassed. 2. Since management had no specific basis for establishing targets, entirely new manufacturing methods needed to be invented to achieve these objectives. 3. Little or no time was spent justifying the cost of the project. The full-time project teams responsible for designing and implementing changes were charged with the responsibility of inventing low-cost solutions that were expected to generate savings in 6 to 12 months or less. Infrequent exceptions were handled through normal capital investment procedures. In countries other than Japan, executives have recently started to adopt the same ambitious targets, and they have had the satisfaction of knowing firsthand that potential for productivity gains is not restricted to any single global area. Equally important, they have learned that these gains do not require a complete change in either national character or company culture. These executives also know that the most important secrets to success are setting high goals, discarding old ways of working, and inventing new, simpler, and lower-cost methods. The setting of seemingly impossible goals thus becomes self-fulfilling prophecy, but not by any magical formula, as radical goals demand radical departures from accepted ways of operating. When enlisting and insisting on the committed and enthusiastic participation of every manager, supervisor, and employee in the drive to achieve performance beyond the levels of competitors, executive management performs its most important role. Today, manufacturers in every country are comparing themselves to the most productive companies in the world, and most conclude that they may be second- or third-rate at best. Usually, however, the measure of productivity used to reach that conclusion has little to do with how successfully the company can compete in the international arena. Several indicators of productivity are measurable; others, such as degree of factory automation, are not. None of the conventional measures -- (1) man-hours of direct labor per unit produced, (2) man-hours (or employees) on the entire payroll per unit produced, (3) product cost per unit produced, (4) degree of factory automation -- are valid for meaningfully evaluating the competitiveness of a company vis-à-vis a company in another part of the world. For example, in some countries, employee compensation and benefits are only a small fraction of what they are in other areas. As a result, the productivity of the factory, office, and executive work force can be lower and yet still place the company in a competitive position internationally. Even when labor costs are comparable, material and component purchases usually make up 60 percent or more of product cost. Thus, purchase prices usually have a greater impact on competitiveness than do payroll costs. Since different manufacturers have different degrees of vertical integration, the one that merely assembles a product has considerably lower payroll costs than the vertically integrated manufacturer that manufactures components and, as well, assembles the finished product. Therefore, total product cost, although less than a perfect gauge, is a more meaningful measure of international productivity. The customer deciding between competing products of equal value should select the product with the lowest delivered price rather than be concerned with the manufacturer's cost. In the same vein, degree of automation is a subjective, and frequently erroneous, criterion for evaluating competitiveness. Glamorous, high-technology automation is often viewed as modern and productive -- even if the automation should be eliminated, as in the case of material transportation and storage, or if the automation itself costs more than simpler, manual techniques, or low-technology alternatives. As long as world trade remains unregulated and stiff international competition prevails, market price is the only practical measure of productivity for manufacturers of products with identical value. Even delivered price has only short-term transient value, since a price can increase or decrease as a result of changes in the value of currency. For example, rapid and sharp appreciation of the German mark and Japanese yen from 1985 to 1987 caused the prices of products produced in those nations to rise sharply in most other countries. In some parts of the world, and especially in the United States, it has been fashionable to chastise manufacturers for losing their competitive position or, in developing nations, for never having achieved one. It is time to realize that large numbers of companies, worldwide, are working diligently to surpass the world-class manufacturers of today, their goal being to become the superior manufacturers of tomorrow. To get started in this race, some companies have viewed a competitive benchmark project as the first phase of a productivity improvement program. But while completing extensive and arduous competitive comparisons, they have delayed work on factory improvements. While it is important to understand as much as practical about the competition, it is a mistake to put off improvements, awaiting study results in order to set targets. For one reason, meaningful comparisons range from extremely difficult to impossible to make, and are based on factors such as the degree of vertical integration, degree of automation, and value of the local currency. And, above all, the main issue is not the competition's stance today or what it will be in the coming year, but how to determine how much a company can expect to improve. As quickly as possible, executive management must set new style factory improvements in motion. It is management's responsibility to specify aggressive targets that will demand quantum leaps forward in the international race for manufacturing superiority. It is not difficult for management to determine what its goals should be, throughout the company, or in individual departments. Experienced managers can suggest improvement targets based on a fast factory tour, Japanese style, albeit with a more logical basis. However, it is less important how the goal is set, than how high it is set. To explain this concept further, the remainder of this chapter deals with achievements of Western companies that now stand as reasonable goals for most manufacturers. One example of a management target is the reduction of the cost of machine changeover from producing one part (or product) to producing another. Based on studies of thousands of different types of machines around the world, experience on changeover reduction shows that the average cost reduction should be expected to be somewhere between 75 to 80 percent. Interestingly enough, after the first project team has designed and installed changes to achieve the initial major reduction, a second team (on a second project) has been able to reduce the remaining cost in the very same range -- 75 to 80 percent. Bringing new objectivity to the problem, the second team can see ways to further improve the changeover -- ways the first team failed to recognize in its close proximity to the process. 1. They demand long production runs, which make it impractical to respond rapidly to unexpected customer requirements. Thus, customers are forced to wait until the end of the long run, at a minimum, before their new demands can be satisfied. 2. Large production runs result in sizable amounts of inventory. Exhibit 1-1 illustrates the basic relationship between lot size and average inventory attributable to lot sizes. When a lot is completed, inventory peaks. But over time, inventory decreases until the lot size is depleted. Then, a new lot is completed. The average inventory attributable to lot size is, therefore, half of the lot quantity. If every item is produced once a month, the minimum possible inventory is one-half the month's supply. If every item can be produced every day, the resulting minimum inventory could be one-half day's supply. 3. Large inventories require plant and stores/warehouse space, people and equipment to transport, stock, retrieve, and distribute. 1. Inventory, machines, etc., from other company plants and/or warehouses can be moved into the vacated space, and the other facilities can be sold or subleased. 2. New products or acquired product production can be moved into the vacated space. 3. With newly vacated space, existing plans for new factories and/or warehouses can be dropped. 4. Walls can be erected between the occupied and vacated space, and the vacant space can be sold or rented. Vacated space can, by itself, be a source of major economic benefit. In most companies, however, improved utilization of space has many more important recurring productivity benefits. Processes designed to improve space utilization eliminate excess work-in-process inventory and the corresponding investment. Permanent reduction of inventory either reduces the carrying costs, or permits investment of the freed-up capital. In addition, smaller spaces minimize the unnecessary movement of staff -- including both indirect personnel such as material handlers, supervisors, equipment repair employees; and direct workers who waste time moving about in areas that are larger than necessary to perform production operations. Improved space utilization also has some theoretical, intangible benefits that produce major economic results. For example, it improves communication among workers themselves, and between employees and supervisors. As well, the following unexpected changes typically occur: improvement of 90 percent in the number of defects, and a 75 percent improvement in equipment downtime. However, these performance improvements cannot be calculated based only on such concrete factors as time and motion, since they result largely from improved communications and team esprit de corps; nevertheless, management should establish targets for such improvements, remembering that setting the target high, and demanding its achievement, are two of the most important factors in success. For most manufacturing companies, reduction of inventory investment and of the associated costs of capital (or alternative investment return) is one of the most important internal sources of improved profitability. Although it is easier and faster to reduce work-in-process inventory, the largest amount of inventory (and, therefore, the area for greatest improvement) is in purchased materials and components and in finished goods. Permanent reduction of the latter inventory depends primarily on the implementation and operation of new manufacturing assembly and machining processes. For example, reducing changeover costs and the attendant ability to produce small production runs are paramount to finished goods reduction. However, achieving a permanent reduction of both finished goods and purchased inventories normally requires more time and effort than reducing work-in-process inventory. This involves implementation of new assembly and machining facilities since the physical layout and the process of the new facility control these inventory levels. When there is no space for work-in-process inventory, it cannot exist. 1. Costs of vendor changeover cause production of large lot sizes. 2. Vendors frequently make late deliveries due to the unnecessary time required to process the latest schedule information into production schedules. 3. Even when the most recent schedules are available to vendors, deliveries are late because a long run already in progress needs to be completed. It is impractical to interrupt a long run because of the penalty of increased changeover costs. 4. Vendors frequently deliver defective materials and components that must either be reworked in house or returned to vendors for repair or replacement. All the root causes of large material inventories can be addressed by a vendor program focusing on specific manufacturing process improvements. These include reduction of changeover costs, improvement of quality, and the provision of capacity flexibility to respond rapidly to new and changing customer requirements. But fearing disruptions in production, managers responsible for factory operations sometimes veto projects that could reduce work-in-process inventories immediately by as much as 95 percent. Accordingly, it is often wise to curtail such resistance by scheduling reductions over a lengthy period of time -- two or three years. Yet, when the process is properly designed, a reduction of 95 percent or more occurs almost immediately, regardless of the target. Clearly, inventory reduction and space requirements are interrelated. Although improved utilization of storeroom and warehouse areas might reduce required space by an average of 50 percent, the long-term target should include plans to decrease the amount of finished goods and material inventory by at least 75 percent. Thus, a combination of inventory reduction and better space utilization enables most factories to have 80 to 90 percent less storage space than historically needed. In October 1980, Andersen Consulting organized one of the first of the "Japanese" productivity seminars, as reported by Robert Hall. Six hundred executives met in the Ford Motor Company world headquarters auditorium and heard thousands of words describing key methods behind the success of the Japanese. Three words of these thousands were to catch the imagination of the Western world: "just in time." These words have come to mean, collectively, every technique of improvement in the reinvented factory. Manufacturers and suppliers need to learn to work together as partners in profit. As suppliers provide defect-free materials and components at lower costs and just-in-time, they contribute to their customers' increased sales and accompanying success. Thus, both suppliers and manufacturers can share in the financial rewards. Successful supplier programs can also reduce the price of materials and components by 30 percent in two to four years, and by 5 to 10 percent each year thereafter. The reduction of suppliers' costs, coupled with maintenance or improvement of their profit margin, should be the basis for supplier price reductions. Since purchase prices represent 60 or 70 percent of the cost of most manufactured products, reduction of these prices will have a greater effect on profitability than will improvements in labor and overhead costs. These reductions should also reduce required inventory investment. For example, a 30 percent decrease in the purchase price should, by itself, cause a 30 percent reduction in inventory investment. The benefits of supplier programs should not be limited to purchase and inventory investment reduction, but should include an 80 percent reduction in defective materials and components, and in packaging and container costs, as well as a 90 percent reduction in business communications costs. These same types of suppliers are also found in the networks of many Western companies; thus, the Japanese philosophy of needing a supplier program, as opposed to a vendor program, may be applicable in the West. Whenever machines and equipment can increase both short- and longterm profitability, they should be used to replace manual work. A manufacturing company that invests in state-of-the-art automation to stay abreast of new developments, but cannot justify the equipment on a normal basis, should acquire and operate it only as a research and development project. And, until such time that experimental use reveals how to operate the equipment within the target ranges of profitability, the company should not replace its workable manual systems. In recent years, numerous businesses have invested heavily, and with some blind faith, in factory automation. However much of this automation increased product costs and lowered profitability, with little or no prospects for future improvement. In contrast, most Japanese improvement projects involve equipment upgrade, not equipment replacement. Worldwide experience has proven that making equipment improvements can usually produce the same target rates and quality of production as buying new equipment -- and at a fraction of the cost. Even when new capacity is required, robots, machine centers, and flexible manufacturing systems are often not the best solutions. Rather, cells consisting of the latest conventional machine tools may not only cost less, but may also perform as productively as higher-cost alternatives. In 12 months of operation or less, productivity projects are expected to pay back their investment. A similarly short payback period of two to three years is reasonable for major equipment purchases. Naturally, there is no single, magical solution for achieving superior manufacturing. Although changeover reduction and space utilization are notably key issues, there are hundreds of other factors that play minor roles. Yet, collectively, all these factors together produce astonishingly substantial gains in productivity and, thus, profitability. Although there are no simple individual keys to success, the executives of companies that achieve the best results establish goals for improvement that challenge the utmost capabilities of their employees. These goals, accompanied by active management support, then become self-fulfilling prophecies. Copyright &copy; 1990 by Arthur Andersen &amp; Co.